Immaculate detached home located in the Vista Plaza community of Aliso Viejo. Rich hardwood floors, crown molding & upgraded baseboards and modern paint colors throughout complement the bright and open floorplan. Enter into the inviting living room featuring a cozy brick fireplace that seamlessly flows to the dining area. The adjacent kitchen is well-appointed with granite counters and fresh white cabinets and opens to the dining area with sliding doors to the backyard. Upstairs, is a spacious loft area â perfect for use as a den, office or convert to a 3rd bedroom (builder option with this floorplan)! The master bedroom features plantation shutters, a walk-in closet and an en-suite bathroom with fresh white cabinets and dual sinks. Down the hall, the secondary bedroom is generously sized and is adjacent to the full hall bathroom. Additional features include newly re-piped with PEX, a convenient two-car attached garage and the nearby community pool, spa and fitness center. 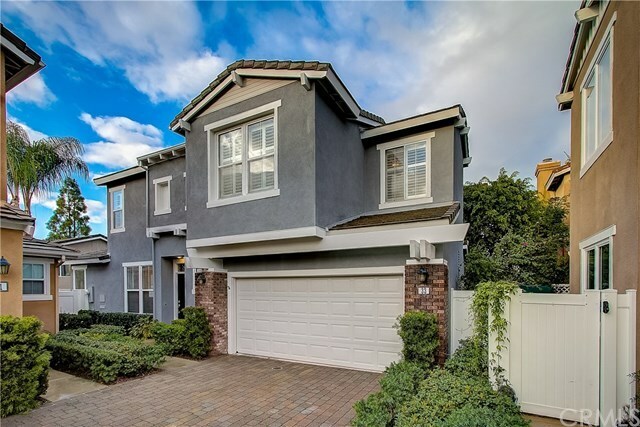 Centrally located nearby Aliso Viejo Town Center, 73 Toll Road, trails, award-winning schools and just a short distance to the beach.